UK tuner Overfinch has been modifying Range Rovers since 1975. The new Overfinch Range Rover is one of the most opulent SUVs ever made, but if you want a more sinister look the UK tuner has unveiled its new limited-edition Velocity model featuring a carbon-fiber hood powerdome, carbon fiber wheel arch trims, and all-new forged 23-inch Cyclone wheels. It’s presented in a Satin Obsidian exterior with darkened herringbone-weave carbon fiber, black gold badging and a bespoke Ebony Lumiere interior. The new, powerdome hood and wheel arch trims complement the Range Rover’s design, while a carbon-fiber grille, front and rearair damss and spoiler give the SUV a more muscular and imposing profile. An Overfinch Bluetooth performance exhaust system also enhances the Range Rover’s V8 soundtrack. 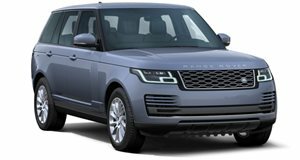 The limited-edition Overfinch is available for Range Rover and Range Rover long wheelbase models. As with every Overfinch, the Range Rover Velocity can be personalized with a range of options including Crushed Carbon for the first time. Fine layers of carbon fiber are cut and laid by hand, resulting in an "intense and unique pattern,” ensuring that no two pieces will be the same. 23-inch forged Cyclone alloy wheel round off the exterior enhancements, available in gloss black or diamond turned finishes. Inside, the Velocity Edition features a bespoke Lumiere interior. Finished in full Ebony Leather, the hexagonal quilt is highlighted with a contrasting Cirrus stitch. As for performance, the Velocity Edition is powered by a supercharged 5.0-liter V8 producing 518 horsepower and 340 lb-ft of torque, enabling the SUV to hit a top speed of 140 mph. Pricing for the Overfinch Velocity starts at an eye-popping £249,990 ($330,000).